Due to warmer weather and clearing work from our maintenance crews, we moved the western SR 20 North Cascades Highway seasonal closure gate from milepost 130 to milepost 134. Crews are currently working to determine a date to begin the annual process of reopening the highway. Check the North Cascades Highway webpage for updates. Due to the weekend forecast for heavy snow, strong winds and cold temperatures throughout western Washington, our crews will move the western SR 20 North Cascades Highway seasonal closure gate west from milepost 134 to milepost 130 at 4 p.m. Thursday, Feb. 7. To access to the closed section of highway, skiers, snowmobilers and other users can park at this location near Colonial Creek Campground/Thunder Knob Trailhead. The extended forecast for the week of Feb. 4, 2019 does call for some low-level snow and cold temperatures in the Diablo area. Crews will continue to clear SR 20 between mileposts 130 and 134 until significant snow or ice builds on the roads. At that time, for the safety of travelers and crew, they will move the seasonal closure gate to milepost 130. We will update this post if that happens. Based on the extended forecast for the week of Jan. 28, 2019 we’ve determined snowfall along SR 20 near milepost 130 is not expected to be significant enough for winter recreation. Therefore, barring a change in the forecast and significant snowfall at lower elevations, the seasonal closure point on the west side of SR 20 will remain at milepost 134 until at least Monday, Feb. 4. Based on the extended forecast for the week of Jan. 21, 2019 we’ve determined snowfall along SR 20 near milepost 130 is not expected to be significant enough for winter recreation. Therefore, barring a change in the forecast and significant snowfall at lower elevations, the seasonal closure point on the west side of SR 20 will remain at milepost 134 until at least Monday, Jan. 28. Based on the extended forecast for the week of Jan. 14, 2019 we’ve determined snowfall along SR 20 near milepost 130 is not expected to be significant enough for winter recreation. Therefore, barring a change in the forecast and significant snowfall at lower elevations, the seasonal closure point on the west side of SR 20 will remain at milepost 134 until at least Tuesday, Jan. 22, following the Martin Luther King Jr. holiday weekend. Based on the extended forecast for the week of Jan. 7, 2019 we’ve determined snowfall along SR 20 near milepost 130 is not expected to be significant enough for winter recreation. Therefore, barring a change in the forecast and significant snowfall at lower elevations, the seasonal closure point on the west side of SR 20 will remain at milepost 134 until at least Monday, Jan. 14. We will close the gates on SR 20 at milepost 134 just as we have every year when the avalanche risk increases. We are committed to keeping the western closure point at that location through at least Jan. 2, 2019. After Jan. 2 we will continue to keep the road open to the gate at milepost 134 until there is significant snowfall to the west, to alleviate concerns about large patches of bare pavement beyond the new closure point at milepost 130. We have heard from many snowmobilers concerned with the change in our operation. We are working with local snowmobile groups to attend/plan a meeting next month to discuss your concerns and talk more in depth about the issues we face on SR 20 while accommodating winter users. Nothing but blue sky overhead as the bright Pacific Northwest sunshine reflects off jagged mountain peaks and snowfields that are hugging the steep edges of mountains in Mount Baker-Snoqualmie National Forest and North Cascades National Park. 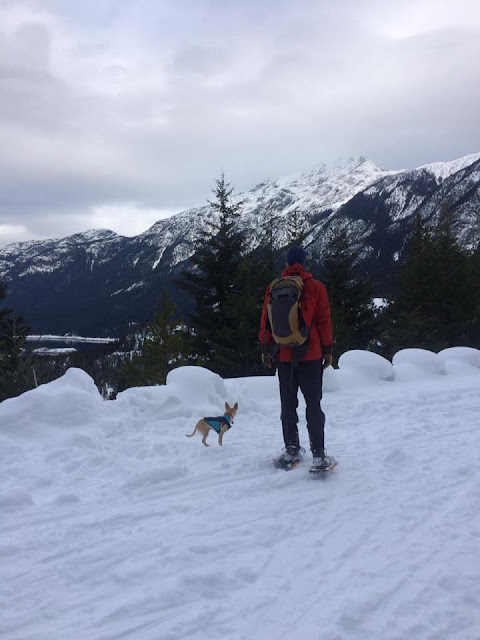 You move forward and listen to the crunch of hard winter snow under your snowshoes as you breathe in the near-freezing temperatures your properly bundled fingers and toes don’t even notice. SR 20 North Cascades Highway includes a 35-plus mile stretch of state highway that closes to vehicles each winter due to avalanche risk. During that closure the area remains open to skiers, snowmobilers, snowshoers, fat-bikers and other winter adventurers to enjoy at their own risk. This winter season, there will be almost four more miles available for those winter activities! and other winter adventurers use the closed section of highway. 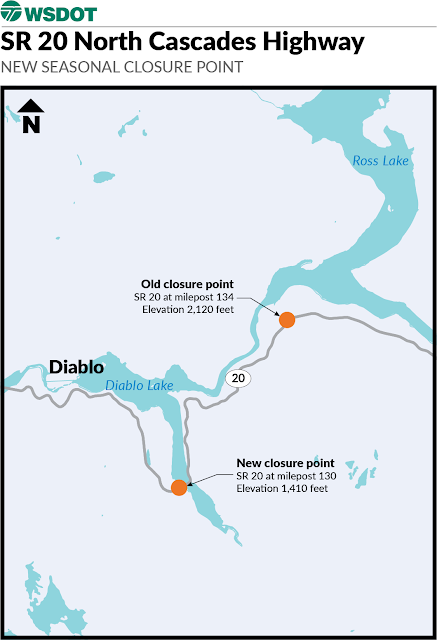 When we first close the highway this season, the closure point will still be at milepost 134 near the Ross Dam Trail. But in January, our maintenance crew will move the western closure point back to the western side of Diablo Lake’s Thunder Arm near The Thunder Knob Trailhead and Colonial Creek Campground, near milepost 130.
four miles west of the old gate at elevation 2,120. This new location still provides adequate parking for those who are unloading snowmobiles or otherwise starting their chilly adventure, but it does mean that the start of the closure area is an uphill climb – so you’ll be able to shed those warming layers quicker than you could in the past. The eastern end will close at milepost 171 in Mazama but will also move back to milepost 178 once snow depth increases and becomes too deep for snow blowers. That usually happens in January, meaning there will be 48 miles of traffic-free highway for you to enjoy a winter workout. The new closure point is at milepost 130, just past Colonial Creek Campground where there is parking available for vehicles, including rigs with trailers pulling snowmobiles. This move is going to help the budget, allowing our maintenance team to spend funds in other areas – where potholes need to be filled and guardrail needs to be repaired, for example – instead of on clearing this four-mile stretch of highway throughout the winter. While we won’t know the exact savings until after we get through a season, we expect it to be significant when you tally up crew time in the plow, the material use and the time spent cleaning up the sand that we spread for traction. But what about our yearly highway opening celebration in the spring? By then, our crews will have cleared those final four miles so the opening day crowd will still line up where they have for decades. As of Nov. 20, the highway is still open for the season, and an average of 1,200 vehicles a day cross Rainy Pass to enjoy one of our state’s most beautiful stretches of road. The highway will remain open until snow really starts to fall and avalanche danger increases, usually around Thanksgiving. 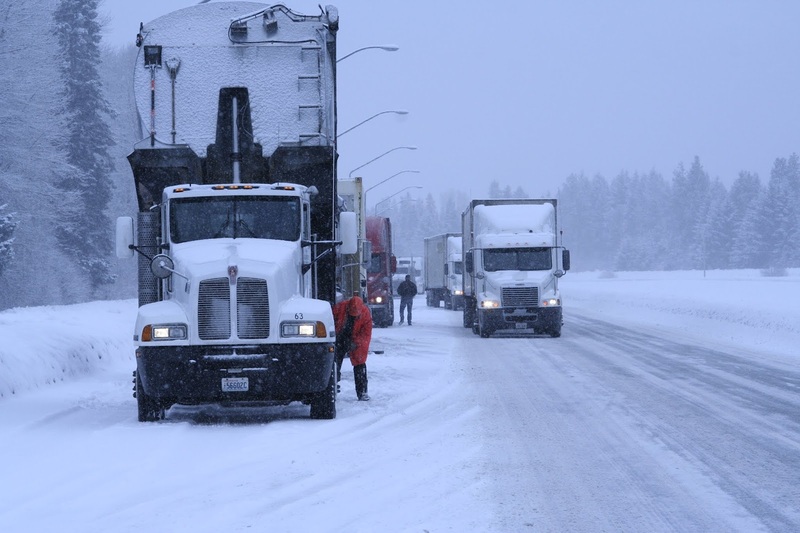 Then, winter activities can commence until sometime in the spring when the snowfall slows and crews start work to clear the highway for the season. 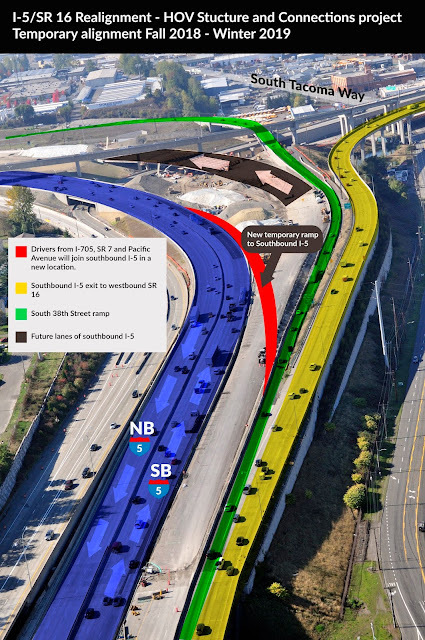 Just in time for the holidays, a temporary lane configuration that sends eastbound State Route 16 drivers on a 2-mile detour to reach the west side of I-5 in Tacoma will be removed as early as Friday morning, Nov. 16, weather permitting. Design-build contractor Skanska recently finished building a temporary ramp that will allow I-705, SR 7 and Pacific Avenue drivers to merge on to southbound I-5 without having to use exit 132A/South 38th Street ramp. Once the new temporary ramp opens to traffic, Skanska can remove temporary traffic control and allow SR 16 drivers to go west on South 38th Street. Why have SR 16 drivers not been able to use the South 38th Street west ramp? In May when southbound I-5 moved into a temporary configuration, I-705, SR 7 and Pacific Avenue drivers had to take the 132A/South 38th Street exit to rejoin southbound I-5 near South 48th Street. This temporary configuration increased traffic volumes on the ramp. Drivers coming from downtown Tacoma were also merging with those coming from eastbound SR 16 to southbound I-5. While it is true that this merge has always been in place, the distance to make this merge shortened. To reduce the potential for collisions, traffic control was installed preventing eastbound SR 16 drivers from merging across two lanes of traffic to exit South 38th Street west. 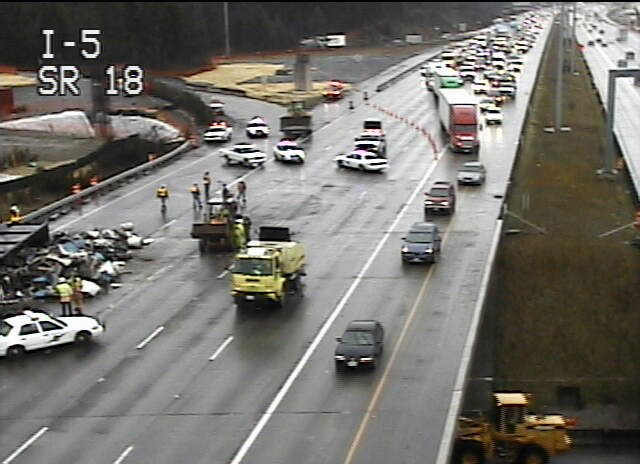 For their safety, drivers were detoured to the South 56th Street exit, back on to northbound I-5, and to exit 132. While this wasn’t popular with drivers, it was necessary due to the amount of traffic on both ramps. Once the temporary ramp is open, traffic volumes on exit 132A/South 38th Street exit will be reduced. We’ve all experienced first-hand the increased traffic congestion near a mall or shopping center during the holidays. This change in ramp configurations will help traffic get to shopping areas more easily during the holidays. Still, be sure to pay attention to your driving, especially through work zones, and give yourself plenty of travel time to enjoy your shopping adventures. Have you ever dropped off your car for an oil change and had it turn into a lengthier and more expensive car repair? Once in a while, our construction projects go the way of that oil change. 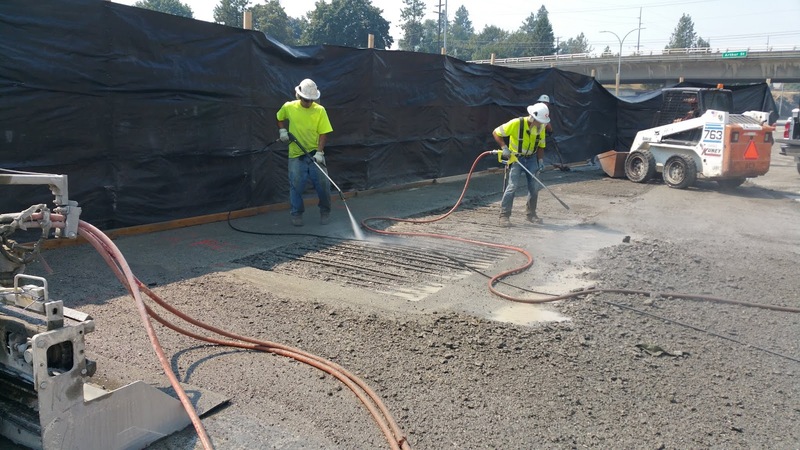 Take the westbound I-90 Hamilton on-ramp repair project in Spokane. 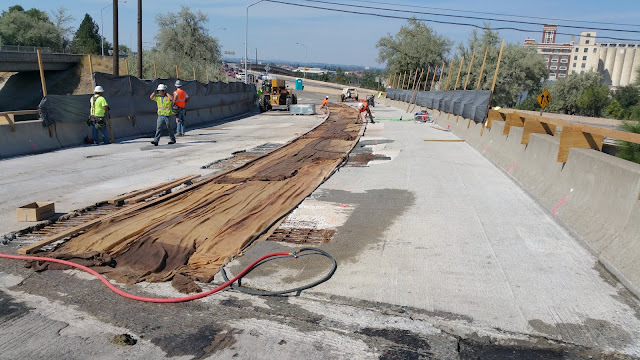 When our contracted crews removed the overlay of the on-ramp, which was built in the early 1970s, they found that the bridge deck needed more repairs than originally anticipated. That meant the on-ramp could have been closed through the winter. Instead, we’re expediting the work to open one lane hopefully before the snow flies. Most bridges will last 75 years until they need to be replaced but since bridge decks get worn down from traffic and weather, they usually need rehabilitation after about 30-40 years to keep them strong and safe. That, along with the fact that it’s about ten times less expensive than replacing the entire structure, is why we are resurfacing the Hamilton on-ramp now. Workers clean up a segment of roadway after hyro-demolition. Like many structures, the Hamilton on-ramp needs to be repaired and resurfaced section by section to maintain its strength – and that involves time. Deteriorated concrete in the overlay of an on-ramp can be removed using hydro-demolition or high-pressure water. This is a cost-effective way to remove old concrete, but it doesn’t work well when the temperatures drop below freezing. What we can’t get done now has to wait until the spring, because there’s no skating allowed on on-ramps! 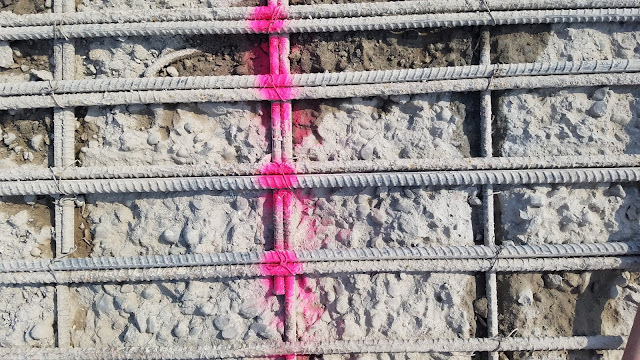 After the overlay of an on-ramp is removed, new reinforcing steel – or rebar – is added to the old rebar to strengthen the structure. In the case of the Hamilton on-ramp, we found that the old rebar was more worn than anticipated, which meant more time was needed to strengthen the structure with additional new rebar. Remaining concrete is chipped out by hand before the concrete is poured; a time intensive process. 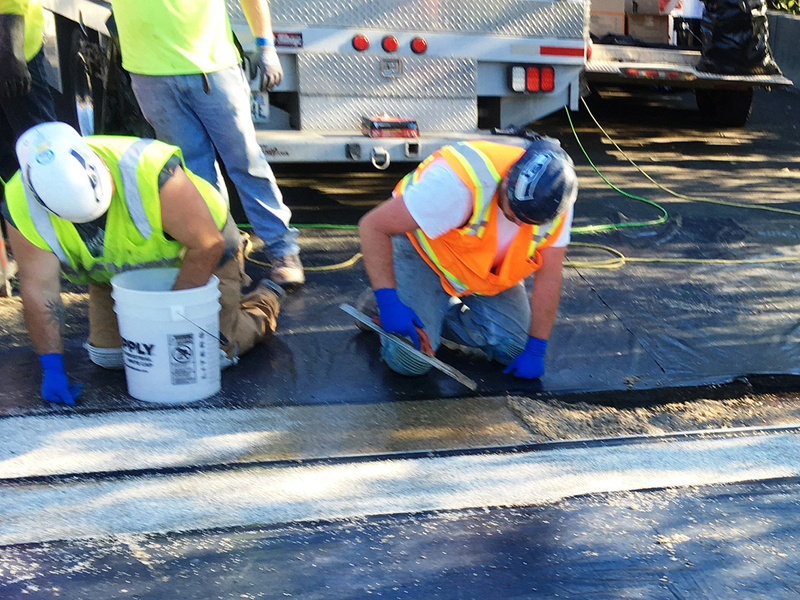 To get one lane open to traffic, we will be applying hot mix asphalt (HMA) as temporary pavement. HMA is hard to work with when temperatures drop since the colder the ground, the faster the asphalt loses its heat, making it almost impossible for it to stabilize. So we’re racing the clock (and the snow) to get the one lane paved and open. The pink paint shows where workers hand-tie wire to secure old and new rebar. 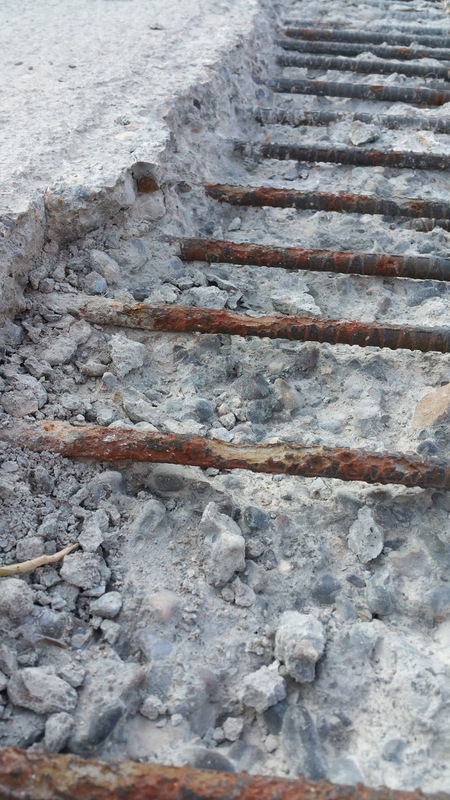 Workers use hand tools to chip out the damaged rebar, marked by orange paint. Lots of orange paint equals lots of time. Just like cars, it’s important to maintain our highways, bridges, and on-ramps to keep them in good repair for years to come. Preparing to pour concrete on the new road deck. 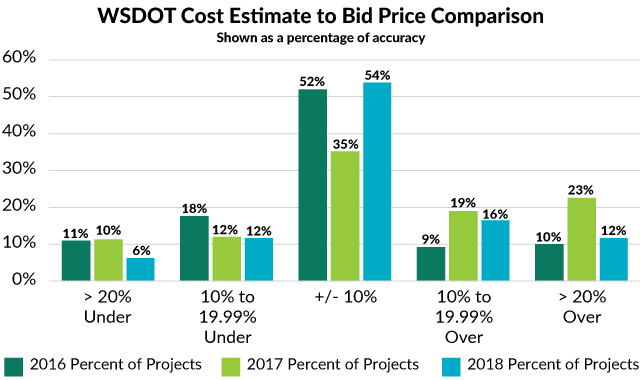 We work hard to deliver high quality projects on time and budget and when projects change and delays happen, we still try to get travelers back on the road as quickly and safely as possible. The best advice is to know your alternate routes and check the construction scheduled to make sure you know the best way to go - and arrive safe. We all know to pull over when we see a fire truck or ambulance with lights and sirens in traffic – it's almost automatic. But did you also know about the Move Over, Slow Down law for response vehicles on the side of a roadway? If you're approaching emergency and other response vehicles with flashing lights on the shoulder, state law requires you to move over into the next lane – if possible to do so safely – or slow down as you pass. This helps keep the response workers safe. It also allows them to finish their work more quickly, which benefits everyone on the road. 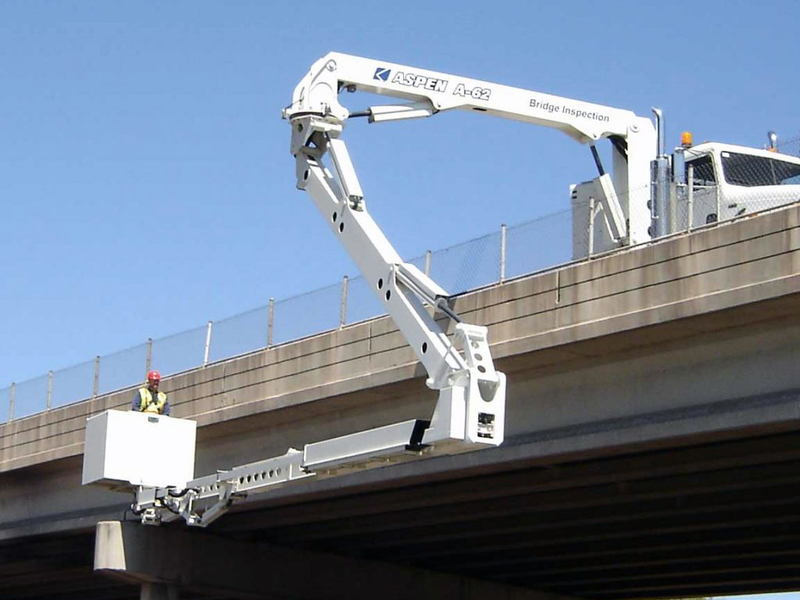 This summer the law was expanded to include highway construction/maintenance vehicles, utility vehicles and other vehicles providing roadside assistance – when they have lights flashing. Remembering the Move Over, Slow Down law is important every day. This week, however, we're making a special point of highlighting it as we recognize National Traffic Incident Response Awareness Week. The week honors traffic responders' vital work and raises awareness about the dangers they face every day while clearing crashes and other incidents. on roadways or shoulders – we need everyone's help to keep them safe. Traffic incidents are the leading cause of death for EMS/EMT responders. 39,000 incident responders are potentially placed in harm's way every day. 20,000 first responders are injured each year while responding to traffic incidents. We want to keep all responders – and travelers – safe, but Traffic Incident Management is also about getting traffic moving again. It includes police and fire officers as well as transportation workers, tow truck drivers, utility workers and anyone else helping to clear an incident on or on the side of a roadway. 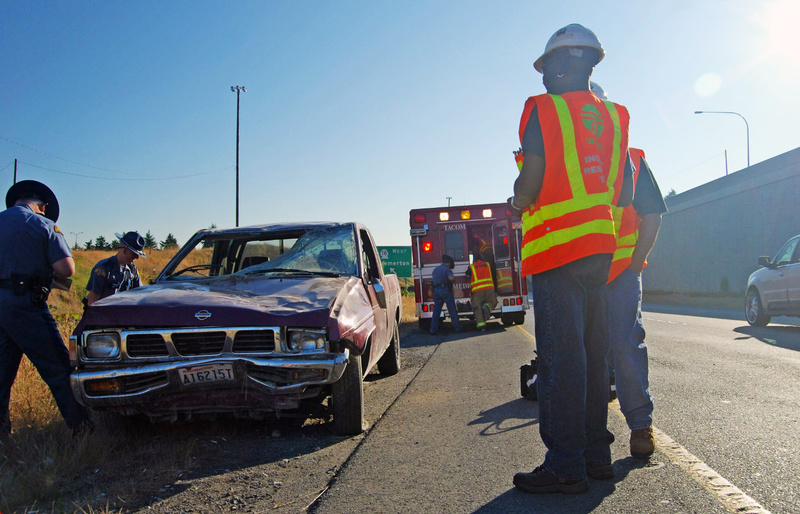 By working and training together, responders can clear crashes more efficiently, saving everyone time and money. Clearing major crashes takes a team of responders, including law enforcement, fire, transportation workers and others. Traffic Incident Management training allows the different groups to work together efficiently. And it doesn't just affect the vehicles involved in a crash. Effective Traffic Incident Management benefits anyone on the roadway. Traffic incidents account for up to one fourth of all congestion on roadways, due to rubbernecking and blocked lanes, and are the largest cause of unexpected traffic jams. The average motorist loses almost a full workweek (36 hours) sitting in traffic due to traffic incidents. Americans burn more than 2.8 billion gallons of gas every year stuck in incident-related traffic — that's almost 24 gallons of gas per driver. Clearing crashes quickly reduces idling and emissions, which leads to cleaner air. 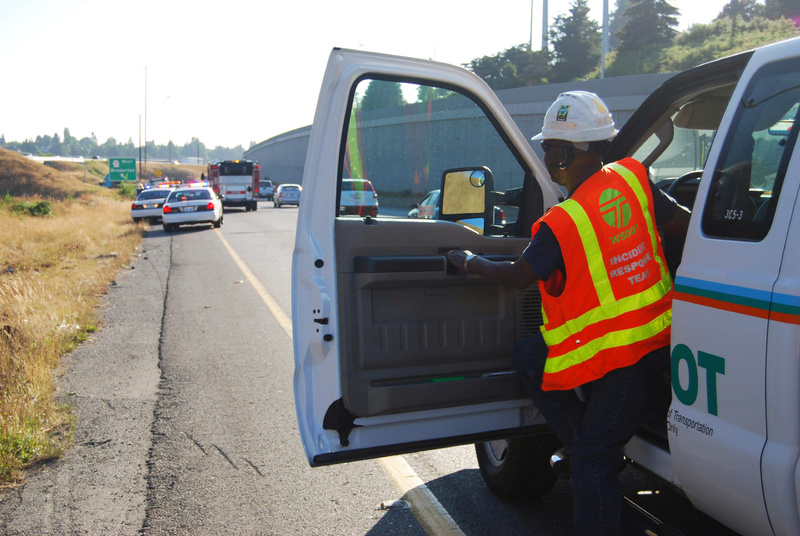 In Washington, our Incident Response Teams provided an estimated annual $87.8 million in economic benefits to travelers and businesses statewide, according to the 2017 Corridor Capacity Report. The benefits come from clearing scenes quickly to reduce the amount of time and fuel spent sitting in crash-related congestion and also by prevent secondary crashes and delays by quickly clearing initial incidents. from flat tires to directing traffic around crash scenes. So the next time you're passing responders working on the shoulder, please remember to Move Over or Slow Down. It's not only the law, it helps everyone get back on their way as quickly as possible. Almost 7 million pounds of concrete — roughly the equivalent of seven Boeing 747s loaded for takeoff – went into the foundation of the future passenger building of the Mukilteo Multimodal Terminal Project. Crews wrapped up the foundation’s construction in September, one year after it began. 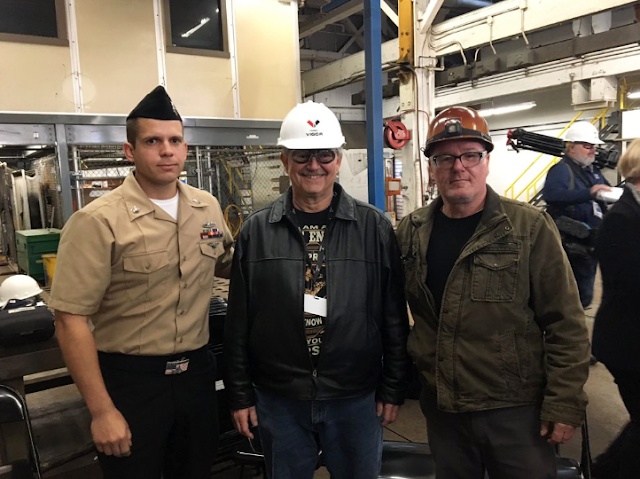 The foundation will support the building, trestle, and support system that holds the moveable bridge connecting the ferry to land. The foundation is laid for the new Mukilteo ferry terminal building. On the heels of this, crews finished boring the final 487-foot-long underground tunnel that holds the stormwater utility pipes. This bore was the riskiest and longest of the project, 75 percent of the total 650 feet of pipe. 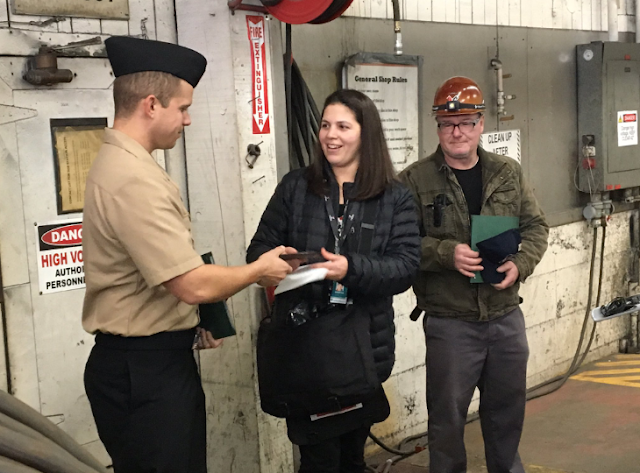 We used an underground boring method rather than digging an open trench to uphold our commitments to local tribes and to minimize ground disturbance, lowering the risk of soil settlement for nearby Sound Transit and BNSF structures. Next, crews installed manhole access to the stormwater system in October, completing this phase of the project. The utility work and the building foundation set the stage for the second phase of construction – the terminal building, vehicle holding lanes, toll booths, and other components – expected to begin in early 2019. 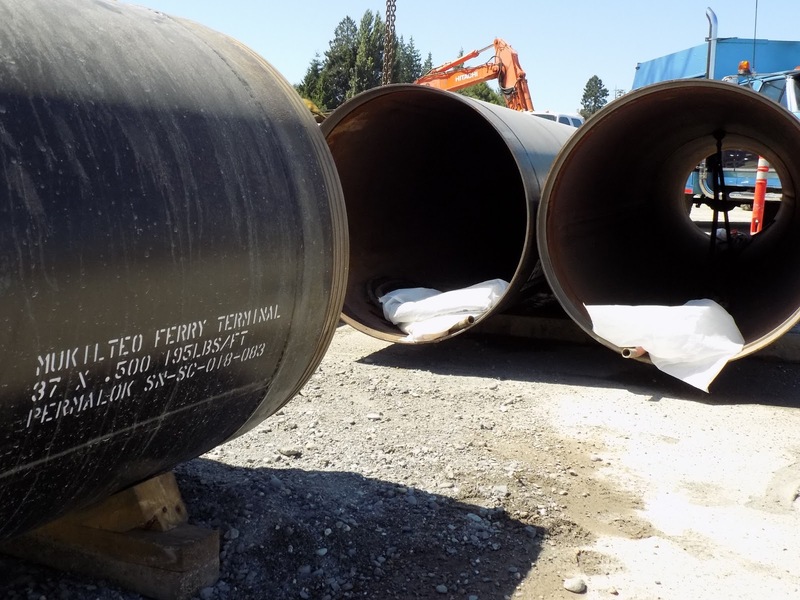 Stormwater utility pipes that were installed underground. The Mukilteo/Clinton ferry route is part of State Route 525, the major transportation corridor connecting Whidbey Island to the Seattle-Everett metropolitan area. It is one of the busiest routes in the state, with more than 4 million total riders every year. The terminal has not had significant improvements since the 1980s and components of it do not meet current seismic standards. 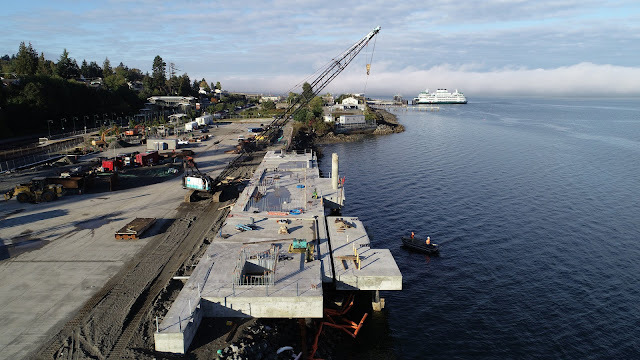 The new Mukilteo ferry terminal, one-third of a mile east of the current one, will provide passengers with improved transit connections, safer and more efficient loading facilities, and improve access to the Mukilteo waterfront. This project has come a long way from the first public scoping meeting in October 2011. Feedback gathered at 11 public meetings and 24 briefings with local elected officials, businesses, and community groups helped shape the design of the new Mukilteo ferry terminal to make it a unique part of our ferry system and a centerpiece of the Mukilteo waterfront. You can find more photos of the project on our Flickr account. As fall rain saturates our state, five new elm trees are soaking it all in, working to establish roots that will honor area veterans for years to come. But this story isn’t just about new trees, it’s about the long history of a symbolic tree-lined highway in Skagit County. In the 1930s, more than 150 elm trees were brought into Skagit County by train and planted along SR 536 – also known as Memorial Highway – in Mount Vernon to honor veterans who died in World War I. As the population grew and land development expanded in the 1950s, many trees didn’t have proper room to grow. They became sick and hazardous, forcing crews to cut them down before they fell on their own and hurt someone. In early 2018, two of the original elms were still standing along SR 536 in front of the Net Drive-In, but like the others, they were dying due to development around them. They had to come down. So one Sunday morning in March, our crews met up with arborists from Washington State Parks to safely cut these rotting trees and keep drivers and people in the area safe. But that’s not the end of the trees or our story. Two large chunks of wood from each of these trees are now in the hands of a local veterans group who plan to use them in new ways – possibly as benches – to continue to honor area veterans. When trees on our property need to be cut down, we look for new areas to plant replacements. An opportunity to regenerate the symbolism came to us thanks to a local veterans group and area Master Gardeners. They were finishing a campaign to replant 50 memorial trees – one for each of the Skagit County veterans who died in WWI – by the 100th anniversary of the end of the war, which happens to be this year. Skagit County veteran Richard Sundance, who helped spearhead replanting efforts, watches as crews remove a dying elm along SR 536. In late October some of my colleagues picked up five young elm trees from a local nursery and drove them over to what would become their new home in Edgewater Park off of SR 536. There, my teammates worked with Mount Vernon Parks and Recreation to plant these new trees, part of the group of 50 new trees honoring Skagit veterans who died during WWI. Our crews help plant new elm trees near SR 536 in Skagit County. As these five new elms – and their 45 fellow trees near Memorial Highway – spread their roots, we want to spread our thanks to the local groups who partnered with us on this project, and most importantly a giant thanks to the veterans and their families for their sacrifice and service. Look out charging stations, we have a new truck that may be coming your way. 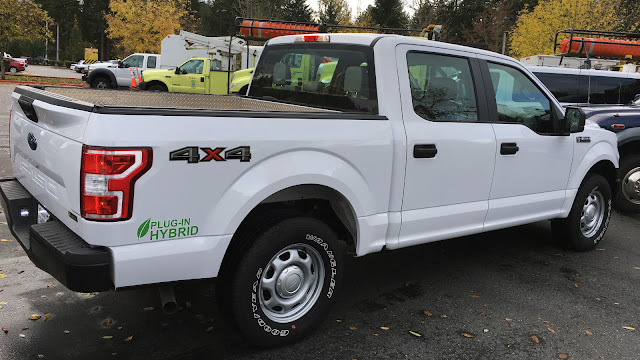 In September we became the first state agency in Washington to purchase a plug-in hybrid work truck, a major step in our continuing efforts to reduce our carbon footprint. Until now, most electric vehicles have been smaller, passenger cars. Electric trucks have been slower to be developed and come to market, meaning agencies with significant construction or maintenance work – and equipment – weren't able to easily switch out to the greener technology. Hybrid trucks like this are an important step for our managers and crews. in the state to purchase a hybrid plug-in work truck. The new Ford XL F-150 light-duty truck will be used in all areas around the state including maintenance, construction and project engineering. We expect to get 21 miles per gallon with the new truck – a 50 percent increase in mpg compared to a traditional work truck – with no additional maintenance requirements. And because it's a hybrid, the truck can be dispatched anywhere in the state with no range concerns, and then be plugged in to charge at its work location. The battery pack assists acceleration for the first 90 miles of travel and then switches to battery regeneration for the rest of the route. A company called XL Fleet builds the plug-in hybrid system that is added to a standard Ford F-150 light duty truck. It includes a 15-kwh liquid-cooled lithium ion battery pack housed in the truck bed as well as two cooling radiators and electric traction motor added to the rear driveshaft. The truck has a 3.3-liter V-6 and six-speed transmission with auto stop-start and regenerative braking. It can be charged using a standard J1772 charging port for Level 1 or Level 2 charging. many work trucks are typically backed in to parking spaces. The battery pack does take up some of the truck bed, but a slide out drawer for tools has been added in front of the battery to make the best use of space. A canopy also will be added, providing storage for items that can sit on top of the battery cover. The battery pack weighs 700 pounds, allowing the truck to still carry 1,200 pounds of payload. A standard light-duty truck costs $29,912; the additional cost for the hybrid features is $23,000. Based on the 50 percent improvement in fuel efficiency, we estimate the payback period for the hybrid option is eight years. The typical agency lifespan for this type of truck is 12 years. 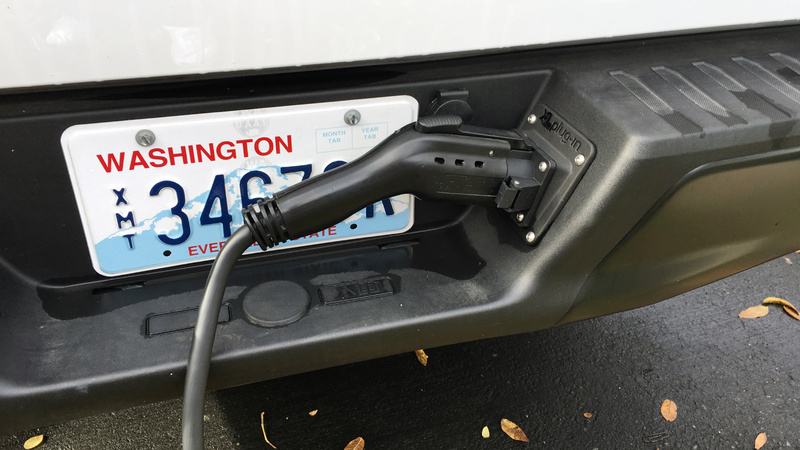 This is another step in our continuing efforts to replace the agency's conventional vehicles with electric, plug-in hybrids or hybrid vehicles to meet both agency and state goals of a green, environmentally friendly fleet. Switching to these types of vehicle helps reduce our carbon footprint and emissions while still allowing our crews to carry out vital work. The battery is housed under a steel plate which also includes a pull out tool drawer to maximize storage. A canopy also will be included to allow for more storage. Light-duty trucks like this make up a significant percentage of our gas-burning fleet, so we're excited to test this new technology and add more of these to our fleet if they function as expected. Bill Shaw's family knows the dangers of drowsy driving all too well. Getting behind the wheel when tired or struggling to stay awake is deadly. The National Highway Traffic Safety Administration estimates it kills 1,550 people each year. In Washington, we average 13 fatalities a year from drowsy driving crashes, including 7 in 2017 and 15 in 2016. In the past decade, drowsy driving was a factor in 754 crashes in the state, according to the Washington State Patrol. And, because there is no test for fatigue, such as Breathalyzers for drunk driving, the National Sleep Foundation warns the actual numbers are likely much higher. In 2006, Bill's daughter Mora almost became one of those fatality statistics. Mora, then 17, was riding with a friend who fell asleep at the wheel while crossing Blewett Pass. The driver had been up for almost 24 hours before the trip, though Mora didn't know that when accepting the ride. The damage to the passenger side of the vehicle Mora Haggerty Shaw was traveling in when the driver fell asleep is shown in this photo. It took emergency crews more than half an hour to extricate her from the vehicle. 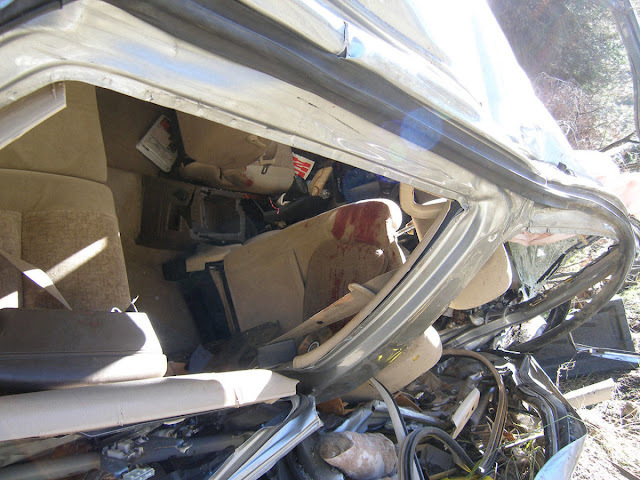 The damage on Mora's side of the vehicle was severe – pictures of the mangled car are hard to look at -- and only the quick thinking of a passing nurse got Mora to the hospital alive. (The others involved had minor injuries). At the hospital, with Mora in a coma, the Shaws were told to start planning for their daughter's funeral. Bill recently recalled mentally preparing himself to lay flowers on his daughter's grave. Thankfully, Mora repeatedly beat the odds through years of surgeries, physical therapy and pain. And this summer, instead of a gravesite, the flowers were in her wedding bouquet as she walked down the aisle. After years of recovery the Shaw family celebrated Mora's wedding this summer. 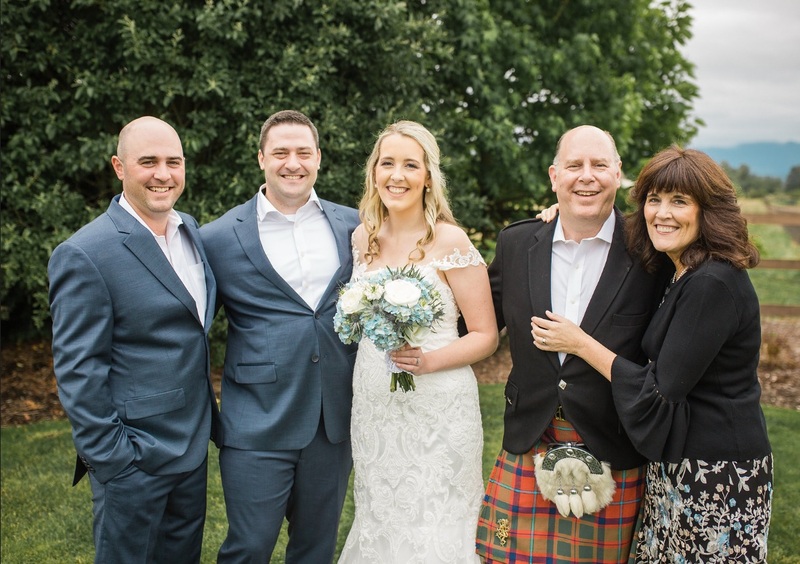 Pictured (from left to right): Liam Shaw, Robert Winstanley (groom), Mora Haggerty Shaw Winstanley, William Shaw, Mary Beth Haggerty-Shaw. It was an especially happy day after all the Issaquah-based family had been through, but the Shaws also point out that Mora still struggles with daily pain and early-onset arthritis. She will need several additional surgeries throughout her life. All of that pain could have been prevented, the family points out, if people better understood just how dangerous it is to drive while tired. They share their story throughout the year but especially during the governor-proclaimed state Drowsy Driving Awareness and Prevention Week taking place this week. The American Automobile Association estimates that one out of every six (16.5 percent) deadly traffic collisions and one out of eight (12.5 percent) crashes requiring hospitalization of car drivers or passengers is due to drowsy driving. According to studies in Australia, staying up 18 or 24 hours can leave you as impaired as driving drunk. And even a few hours of missed sleep can dull reactions behind the wheel. The AAA Foundation for Traffic Safety found that people who sleep six to seven hours a night are twice as likely to be involved in a crash as those sleeping 8 hours or more. People sleeping less than five hours increased their crash risk four to five times. That's what the Shaws want others to know: That getting behind the wheel without enough sleep puts everyone at risk. If they save even one person's life by sharing their story, Bill said, their efforts will have been worth it. Here are some tips to avoid and recognize drowsy driving. Get adequate sleep — most adults need 7-9 hours to maintain proper alertness during the day. Schedule proper breaks — about every 100 miles or 2 hours during long trips. Travel with a buddy — someone to talk with and share the driving. Avoid alcohol and sedating medications — check your labels or ask your doctor. We’ve seen a trend over the past few weeks, and it’s not one anyone likes. 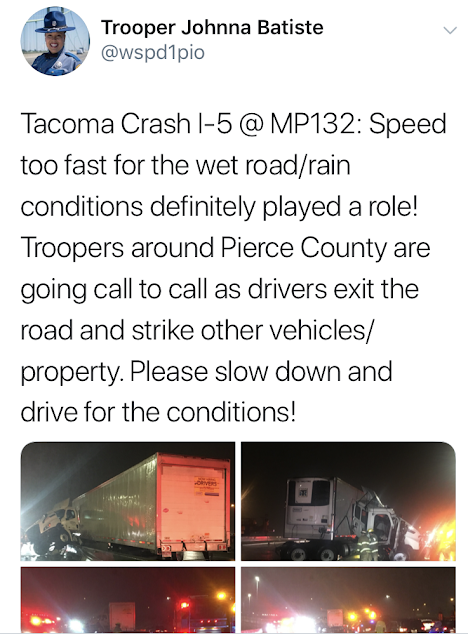 On three separate occasions during overnight hours in Tacoma, all lanes of Interstate 5 near the State Route 16 interchange were blocked by collisions. According to the Washington State Patrol, high speeds, inattentive driving, and not driving for conditions were contributing factors. 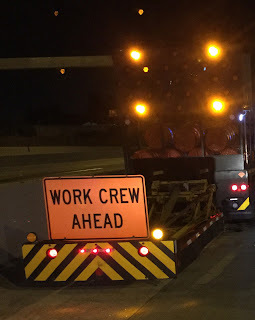 all signage near work zones. 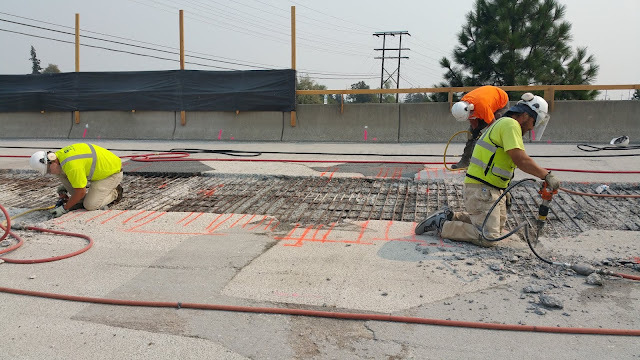 The collisions occurred within the boundaries of our I-5/SR 16 Realignment – HOV Structure and Connections project, where both directions of I-5 temporarily have narrowed lanes and shoulders. The highway has been in this temporary configuration since May while design-build contractor Skanska rebuilds southbound I-5 in a new alignment near SR 16 to accommodate future HOV lanes. Having a work zone with narrowed shoulders and lanes is common, and it requires drivers to pay extra attention to the road. When there is less room for error, glancing at your phone, changing radio stations or allowing other distractions that take your eyes off the road is not a good idea. Speeding, following too closely or aggressive driving behavior is also not advisable. We’ve enjoyed five months of gloriously dry weather, and as the fall rains begin we could all use a reminder that driving on wet pavement is different than driving on dry pavement. Please slow down, especially when driving through work zones, and pay attention to your surroundings. The extra couple of minutes spent getting to your destination may end up being the most important minutes of your life. We are taking steps to help drivers better navigate through our work zone. Skanska recently repainted the lane lines and installed new reflective pavement markers on both directions of I-5 through the project. They have also added reflective markers to the median barrier, and motorists will soon see signs that encourage drivers to pay attention and slow down. Nothing is more important than focusing and being alert while driving, for everyone’s safety (Photo courtesy Oregon DOT). I-5 will be in this temporary configuration at SR 16 for another few months, and during this holiday season we all want to go home safely to our families and friends. We also want to thank you for your patience as we work to wrap up this major construction project. We want to welcome home the first fish to find their way through the newly redirected and restored Little Pilchuck Creek in Snohomish County! 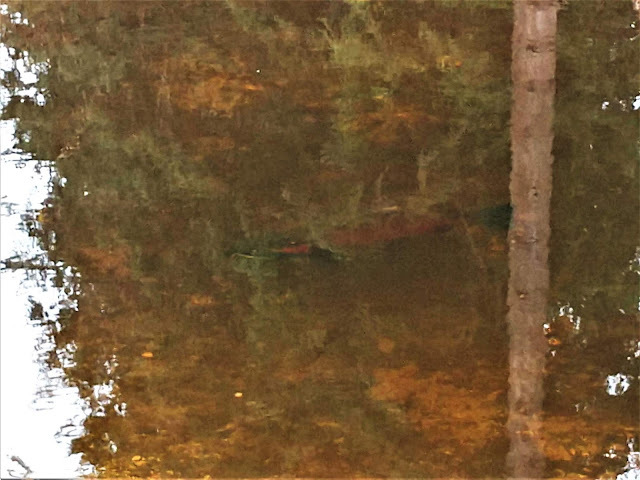 Just weeks after the bulk of this $6 million project to widen the passage under SR 92 wrapped, we caught our first glimpse of migratory fish in their new digs. Before the renovation, migrating fish crammed through a tiny and fast-flowing 12-foot box culvert under SR 92 at North Machias Road in Lake Stevens. In June 2018, contractor crews with Graham Contracting, Ltd. removed that existing tiny culvert and replaced it with a 66-foot wide arched bridge. The new wider creek bed, which was also designed to be less steep, has slowed down the speed of the water, making it easier for migratory species such as trout and salmon, to pass under SR 92. The new bridge was then buried under a few feet of dirt, and the highway was paved back on top. Crews built the new bridge piece-by-piece over 18 days. We condensed the work into this one-minute video. As any fan of home decorating knows, old wood can be repurposed in numerous ways in a new home .. even for fish. In this case, we took woody debris (think: dead tree trunks and buried logs) that were dug up, exposed or removed during the clearing process and placed them downstream to provide natural “rest stops” during migration. These chunks of woody debris also provide nice hiding spots from predators soaring overhead. Bonus: just like any home improvement project, repurposing the old wood allowed us to save some money on this project. This strategy of rebuilding the creek from the ground up allowed our design and construction teams to restore Little Pilchuck back to its natural state. This project helped us comply with a U.S. District court ruling regarding historical tribal fishing rights. It also expanded fish access to almost 30 miles of habitat upstream. Anyone who has done a home improvement project knows they’re not all the same. This fish passage project was much more involved than most. We want to thank everyone who altered their plans, took the detour, took alternative routes, carpooled and made other changes to their daily routines during the closures and delays associated with this project. This weekend, we turn our clocks back an hour at 2 a.m. Sunday, Nov. 4, and for many of us, we'll start living like moles - going to work in the dark, coming home in the dark - sigh! Unfortunately, the numbers tell us that if you're a person who walks during these darker days, you're more likely to be involved in a collision with a person driving a vehicle. For someone like me, these shorter, rainy days mean a few changes to my daily after-work walk routine. I'll start wearing my light-colored jacket, a reflective vest (fashionista!) and carrying a flashlight in hopes that drivers see me when crossing driveways and intersections. I've been doing this long enough to know that even in the best of conditions people driving don't always see me, or they're simply not paying attention. Left: Using cross walks is always a smart idea, but remember to be cautious even when the crosswalks are well marked. Right: Wearing brighter clothing is one way to help make yourself more visible when walking at night. We can't always "gear up" with visible clothing for walking in the dark - sometimes it's just not possible or practical. Think about the times you've made impromptu plans to meet friends for dinner and had to walk to your vehicle or bus stop in the dark. Or what about the person who has limited means - they might be fortunate just to have a warm coat - regardless of the color. Clothing and any reflectivity or lighting you have with you are the last line of defense, not the first. Try to cross the roadway at lighted intersections - it might mean walking a bit further, but it's where a person driving a vehicle might better see you and expect you to cross. Don't ever think that a marked crosswalk will protect you - by law drivers are supposed to stop to let a person cross the roadway at ALL intersection crosswalks - marked or not - but apparently not everyone has received that message. Never assume that if one person stops for you to cross the roadway, the person in the next lane will. I hang back in front of the stopped vehicle until I'm sure the person in the other lane plans to do the same. Again, the law tells drivers to stop when they see another stopped vehicle, precisely because they don't know what's beyond their line of sight - but not everyone does that. Walk on the sidewalk if there is one; otherwise walk facing traffic so you can see what's coming at you. If there's a running vehicle in a driveway, make sure the person driving sees you before you cross. It's worth the wait to see their surprised face rather than to have to try to dodge out of the way. Be wary of crossing in front of drivers turning right; they often approach the intersection with their heads cranked to the left, looking for an opportunity to enter traffic. When they start moving and finally realize I'm standing at their passenger window, I like to smile, wave and thank them for not killing me. 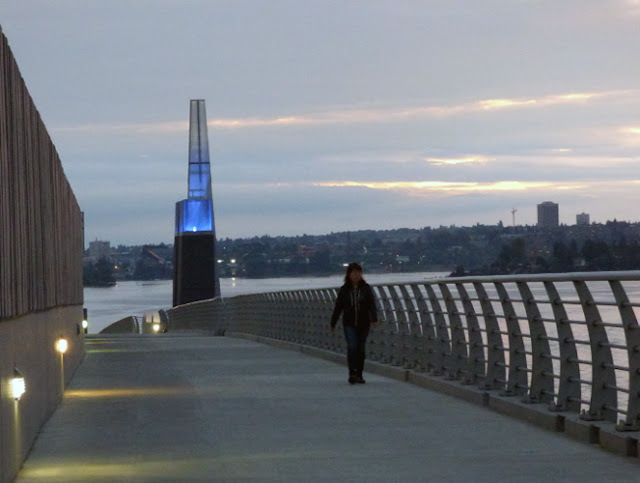 Walking on paths or areas with good lighting can help keep pedestrians safe as days grow darker. Don't get me wrong, I don't hate people who drive. I'm a driver too and I've made my share of mistakes behind the wheel. However, hoofing it on a regular basis has made me a better driver, more aware of all people who share the road. Fortunately, with my mistakes no one got hurt - and, really isn't that the point - making sure everyone gets to go home safely at the end of the day? Let's all slow down and take a little extra time to compensate for the reduced visibility during the next several months.